Loving Sarah’s idea for a remix challenge and joining the party late, as she did it for February… After 3 days of mostly neutrals, I decided it was time for a little color….Well, more like a “PUNCH” of color! 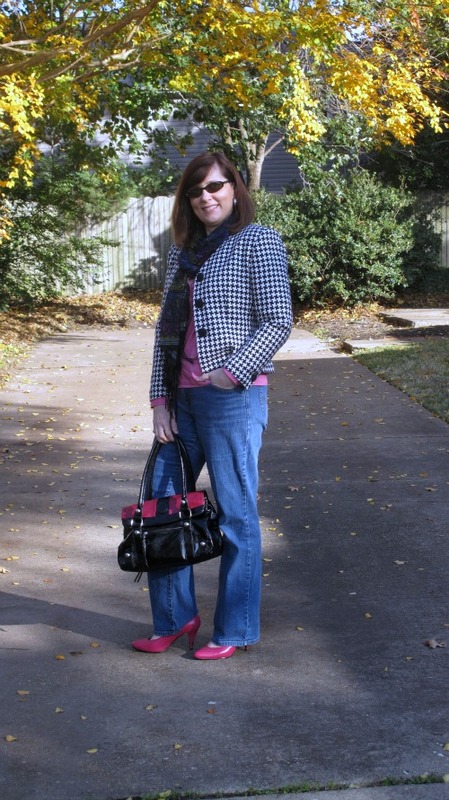 If you are a close observer you may note that I actually carried over three items from yesterday, the leggings, ballet flats and purse… You have to admit that fuschia is quite an influx of color compared to the three previous looks! This was a perfect Mon on the Go look for my day of homeschooling, laundry and a quick walk to the grocery store with my homeschooler…We love going for walks some days and since only in year 2 of homeschooling it still feels special to be out and about during traditional school hours. Dear Readers, do you hate it as much as I do when you have to face replacing a favorite pair of shoes? If you are a blogger are you feeling as grateful for the extra daylight that allows for more opportunity for picture taking? Gratitude; I am grateful for the breakdown with a child today that led to a break through..(just wish I would remember that the breakdown means a break through is coming around the corner) I am grateful that my husband got his check a day earlier than we anticipated. I am grateful for the walk to the grocery store with my youngest and the memory of how much my walks with my father are a part of his legacy. I am grateful for finding this remix challenge and how much fun I am having with it… I never said how long I was going to keep this going…. Hounds tooth, what can I say? LOVE IT! I can not seem to get enough of it. I really don’t own a lot of it, but am constantly finding myself drawn to it. Wondering perhaps if I shouldn’t seek it out in a purse or other accessory so that I can wear it more often… Now, that’s a thought…. Now for the original inspiration…. I really liked this color shirt underneath and just the casualness of adding it to a pair of jeans…. This was originally from CACHE, but is coming up as no longer available…. and one more, this time with a hat, to really be more like myself…. I definitely can see me doing this look for a casual night out with friends. I am actually feeling kind of sad that I only have one more day left in this Challenge! I might just have to make this a regular feature for my blog….I love it, this is my blog and I get to play with it and design it any way I chose! Don’t forget to come back tomorrow for the final day of this week long Challenge and to vote for which outfit you like best? As always Dear Readers, your comments are welcomed and appreciated… head back to the top of this post to leave your comments, I look forward to reading them! Just have to say so glad today is Friday. This week I just have not been sleeping well and that makes for a less focused me…I think I should have just done what my high-schooler does and nap everyday… He literally comes home gets a snack and passes out on the couch in the den. Tv and conversations all around him don’t matter a bit. I would need to be in the dark bedroom with a fan for noise to sleep and am quite jealous that he can doze off so quickly. Hope my sleep pattern just goes back to something better next week..
Half price days at the Salvation Army are fun…. They even opened the doors 15 minutes early for us. Tried on a lot of clothes this time and put back most of them. It is hard to buy clothes knowing that my weight loss will continue. 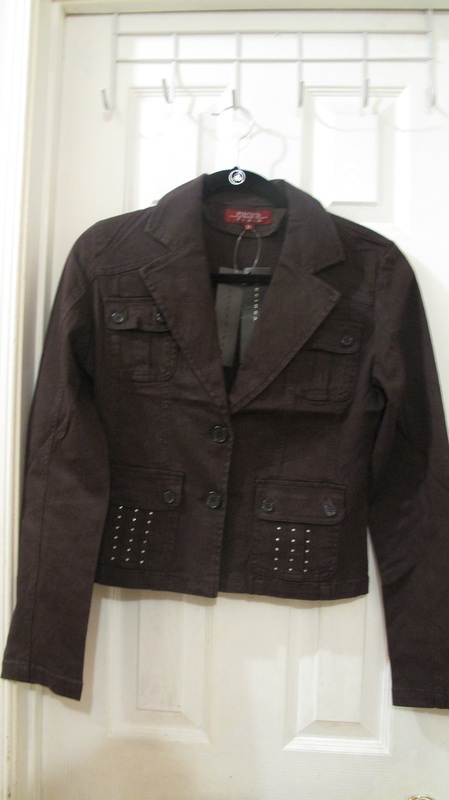 It really shouldn’t be this difficult to commit when the items are never more than $3.50.… I will have to replace an entire wardrobe by the time I get to my goal, which is hard since I had leather blazers and things I really love. As I get close to my goal, I will not be thrifting and just making one replacement purchase per week. What I am looking forward to is after Christmas sales since I should be reaching my goal in January. Good way to replace major things in an economical way. I did pick up two skirts and I really like them both. 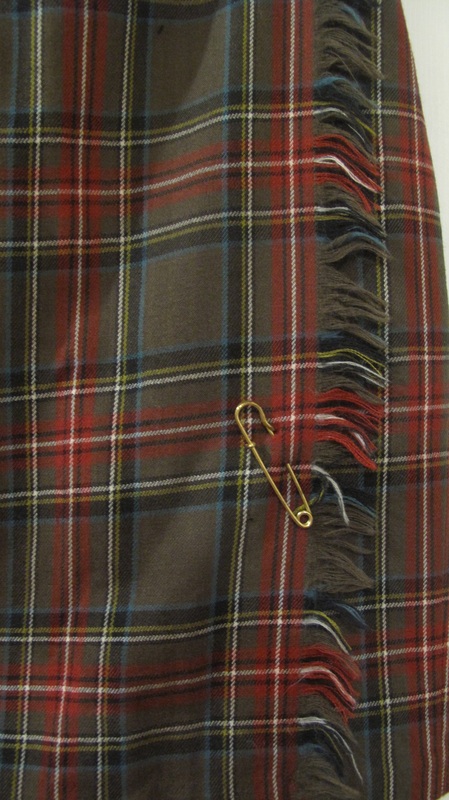 The brown plaid kilt really appeals to my Scottish heritage. As a child my mother always made sure I had kilts and I have such fond memories of them. Of course back then, I wore more the classic navy and green paid or green with a thin line of red and yellow… This brown one really said Fall to me and I can see fitting it into my style. I am happy to say this one is too tight and should be perfect for my goal weight! 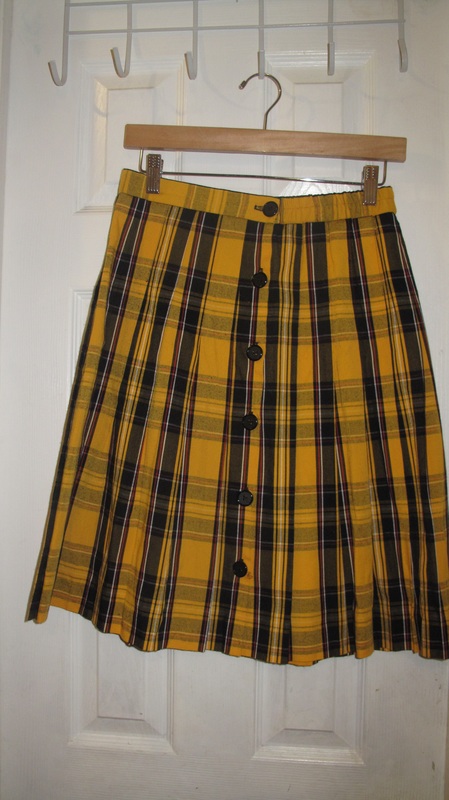 In the past two years, I have really embraced color into my style and this yellow plaid skirt really appealed to me..I love the A-line and pleats on this one and can’t wait to wear this one, but need to loose just a tad more weight to feel comfortable in this one..
Can’t go wrong with a snakeskin print dress! I know I’ve said this before, but I could wear dresses and skirts daily, I just love feeling feminine, flirty and sassy. 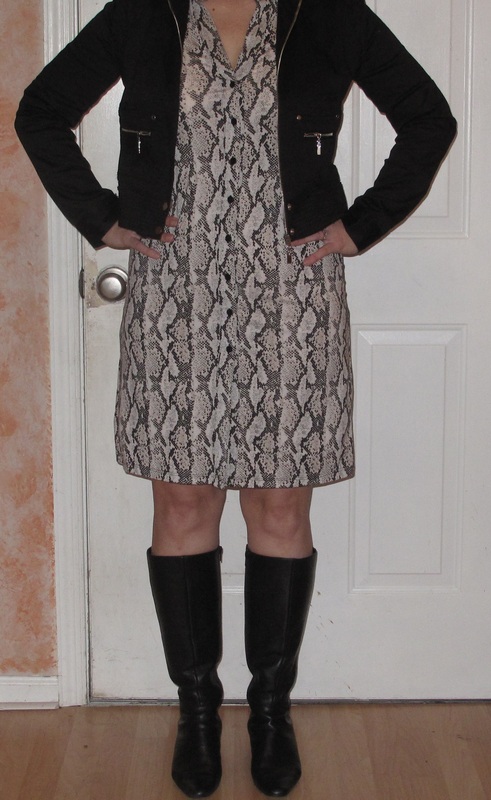 I will probably say this again in the near future….A big thank you to my thrifting partner who discovered this dress. These two jackets were recent eBay purchases in an effort to get shorter jackets to work for my petite height.. I love this chocolate color and the fit is great! It is a duplicate of a green one I wore previously. 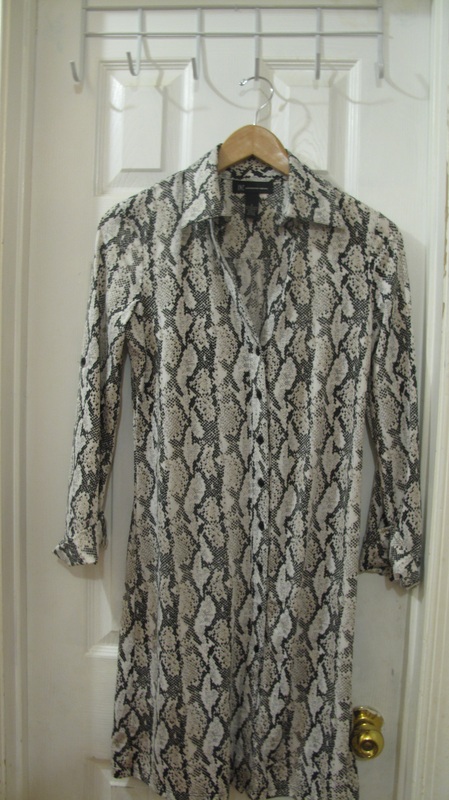 This black one is the one pictured above with the snakeskin dress. I love that it is casual and even has a hood. I think I spent about $15 on this with free shipping. 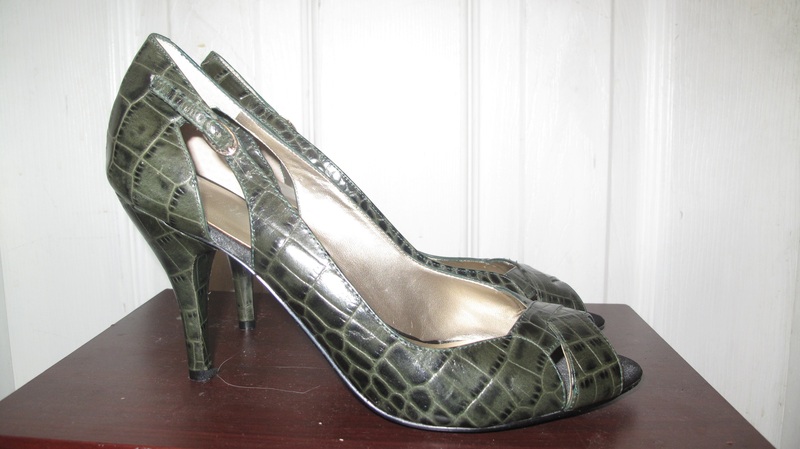 Last of all is these green reptile Nine West pumps. I see these for warmer months, but when thrifting you snag the good stuff when you see it and don’t always purchase in season. 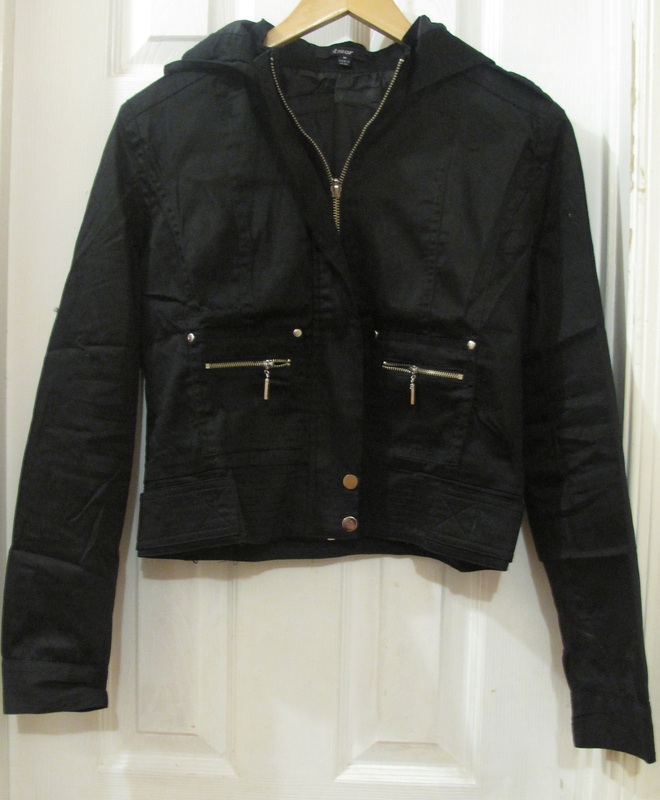 I think I will not thrift at all next week to save my budget for a faux black leather moto jacket. it has been on my wish list and will be a lot better investment. Of course I will have to buy it tight, in anticipation of my future weight loss. I really can’t wait to hit my goal weight and not have to worry about this anymore.. 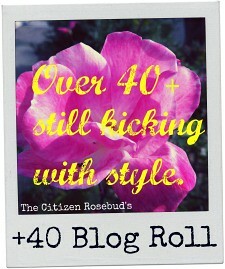 I am so going to celebrate reaching my goal! Gratitude- I am grateful for the weekend and a break from blogging and homeschooling. I am also grateful for the opportunity to relax and hang out with friends. Comments are greatly appreciated and may be left by clicking on the Leave Comment at the top of this post! When I put together outfits to photograph, I try them all on and think I am set for the week. Then I go look at the photos and I am not always pleased with the results. There really is something so different from the way things look in the mirror and what a camera lens reveals. How can they be so different? I am just grateful for this experience and what I am learning from dong this blog. While I don’t dislike the above outfit. It is not spectacular. I love the dress and the jean jacket is one of my favorite pieces. I think that the dress is in such subtle shades and the jacket helps. Would love my dear readers to give their views here, just be gentle and kind as it is really hard to put yourself out here like this….Any suggestions to take this to a different more lovable level? I was really fond of this outfit in the mirror, but think the sweater is one I should hold off on until I lose some more weight. 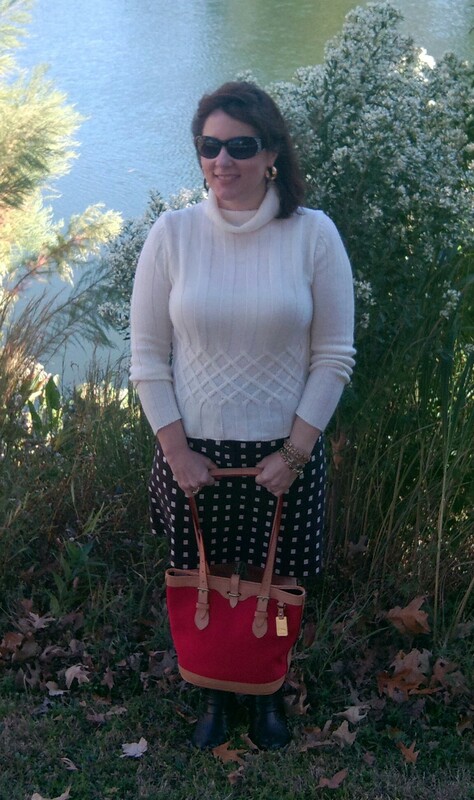 I think it doesn’t show my curves at all and over emphasizes my bust… This skirt and sweater are ones I thrifted and intended to use as my body shrinks, so will revisit this combo in the next two months…. I really think it has potential… The best part of this photo and why I didn’t just ditch this picture is my purse. It is a Dooney and Burke, given to me by a good friend. She asked me if this was my first Dooney and I replied that it will probably be my only one. The great thing is that I don’t feel at all deprived for not spending hundreds of dollars on a single purse. I am so blessed in my life and that is just something that has never really mattered to me. Gasp, I know what kind of fashionista am I? A passion for clothes and a love for styling them is all it takes to be a fashionista and I have an infectious love of both those. Comments are appreciated, my apologies that you have to return to the top of this post to do so, I would move it to the bottom, but couldn’t find out how…. 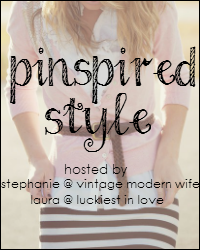 Tomorrow is A Lucky Find Day with my purchases of the week, mostly thrifted items…!